A "must have" for your flight bag. 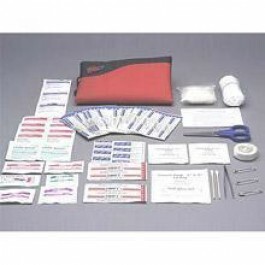 The Lifeline First Aid Pit Stop 80-piece kit is designed similar to a bill fold with an easy access from the center. It includes a smart mix of basic First Aid supplies, including bandages, gauze pads, dressings, tape cleansing ointments, pain relievers, scissors, and more. An inside zip pocket and convenient mesh pocket provide you with several options to hold... More supplies.